The Sale Is Here. The Pre-order Is Here. The Reading Is Coming. The Festival Is Coming. 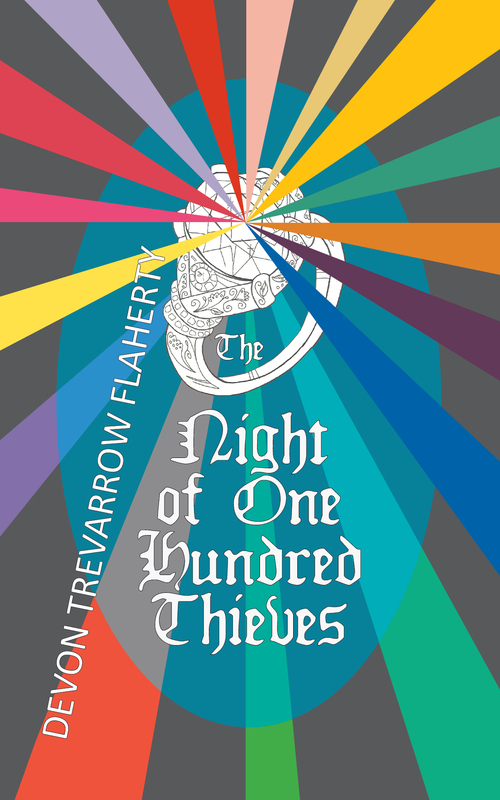 The Night of One Hundred Thieves is a fantasy/medieval magic realism novel about thirty-two thieves and one magical ring. They all want it. It needs them. But can they all have it? Who will be the last thief standing? Do you like Lord of the Rings? How about Oceans 11? And Love, Actually? What about if they were all smashed together in 220 pages? This book sprang up after Benevolent was published and reviewed and I started getting requests for more Gaby and Mikhail, but really more Northwyth. My husband especially hankered after an expansion of the Northwyth legends. So, for my first attempt at NaNoWriMo (National Novel Writing Month) in November 2013, I set aside my current project–The Family Elephant’s Jewels, out in early 2016–and wrote–like I was supposed to–a book in one month. With a serious back injury, it didn’t exactly work out that way, and the book was never about Gaby and Mikhail (but rather about The Queen), but by 2014 I had a complete novella on my hands and a lot of editing to do. Last year I spent working on no less than four projects at one time, including the re-writes and edits involved in making The Night of One Hundred Thieves a novel worth publishing. So ta-da! 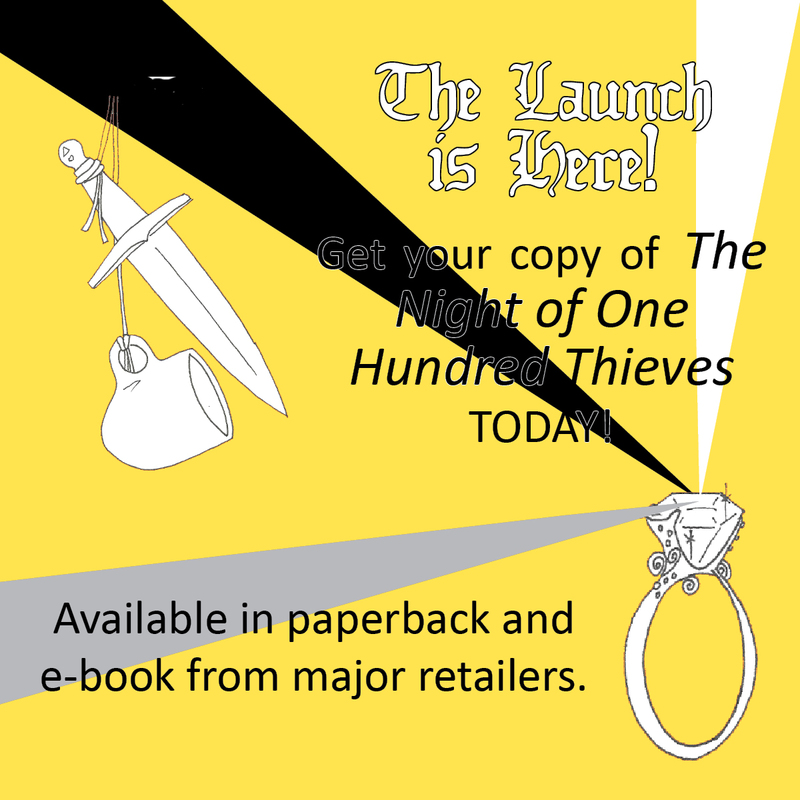 Owl and Zebra Press proudly presents our second novel, The Night of One Hundred Thieves! If you are a friend (or just friendly) and you want to know where I get paid the most (one of the questions I get all the time), the answer is this: first, buying the book directly from me, but I will have very limited copies; two, Amazon; three, Smashwords (e-book only); four, Barnes & Noble, Kobo, the library (per copy), local bookstores, etc. ; five, rentals. Actually, I have yet to figure out how in the world the rentals are paying me at all. It’s on my to-do list. So really, the answer to that is Amazon. here. I’ll be posting blogs throughout the day to celebrate the launch and to host giveaways! 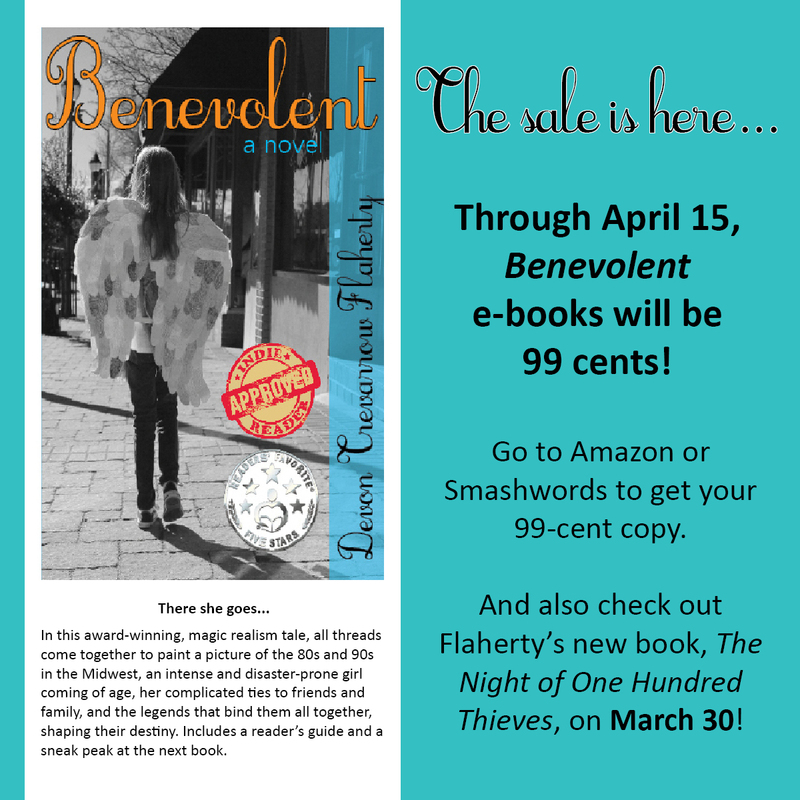 Benevolent e-book sale. The 99-cent e-book sale will continue until April 15! Get your copy now, cuz everything on the calendar always seems so far away, but it’s really not. Get it at any of the places listed above. Blog Tour will be happening over the next two weeks, maybe a little longer. Keep your eyes peeled (ew!) for appearances here and there in the blogosphere. It’s sure to involve not just riveting interviews, but also more giveaways. Lit 101 open mic and discussion night. It happens every month, but here’s your chance to write it in your datebook. If you are a local writer (or you are a local listener), come on out to Lit 101 at Francesca’s on Ninth Street in Durham at 7pm on Sunday, April 19th. I will be guest-hosting this month while the founder gets married. Yes, he’s trusting me with a PA system. 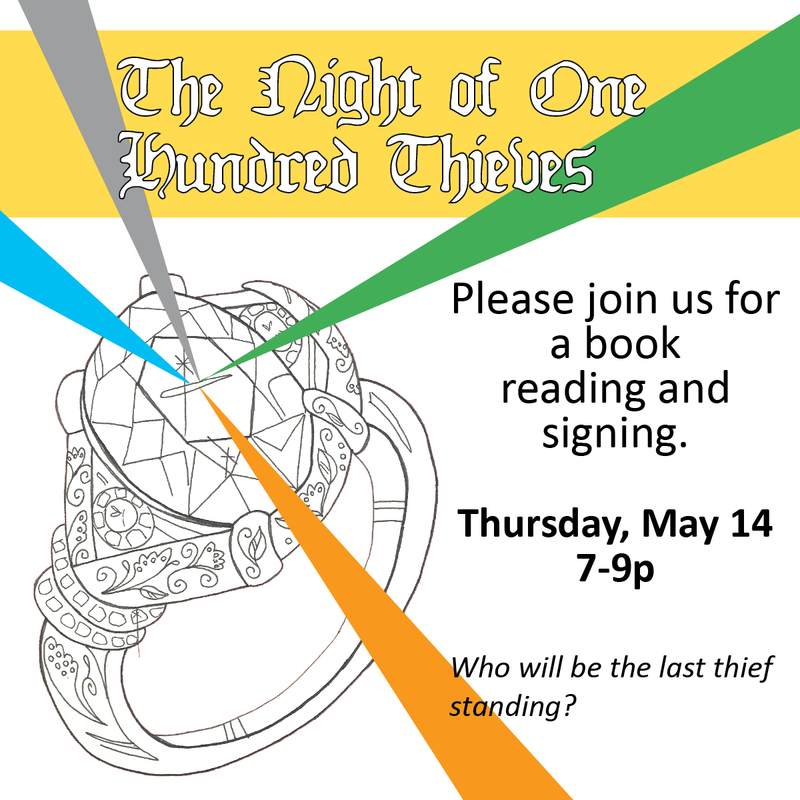 Reading and Signing for The Night of One Hundred Thieves. If you are local, this is a great time to be a groupie. The event is from 7-9pm on Thursday, May 14 at the Regulator Bookshop on Ninth Street in Durham. 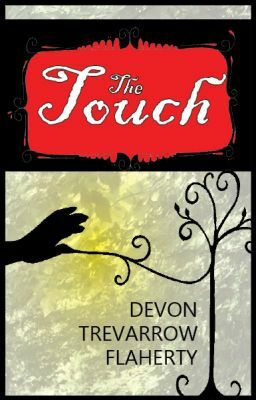 The Touch is my ultra-modern online writing project, and you can follow along at Wattpad to read a new novel (?) as I write it. That’s right! 1200 words at a time, you can read as I reveal the story of the irrepressible and angry Dane as she stumbles into the lost City of Gold in southern Indiana looking to hide but finding so much more. You can join in at any time and catch up at the website. The Journey of Clement Fancywater will be the next novel published by Owl and Zebra Press and written by me, much later in the year. Perhaps this novel would make a great Christmas gift? About a thirty-year-old failure who is pushed into Hollow Earth and destined–or asked, anyhow–to become a real live hero-of-epic-proportions. Other Owl and Zebra projects include a journal, a holiday home series, and a reprint, as well as the launch of our children’s imprint. Stay tuned over the next coupla’ years for super exciting developments. The Family Elephant’s Jewels will be the next-next novel published by Owl and Zebra Press and written by me, in 2016. Perhaps you will buy the book because by book four you will be utterly addicted to my novels? About a woman who dies with her secrets, leaving her seven children to uncover them one at a time, meanwhile unhinging something in themselves. And when you’re reading The Night of One Hundred Thieves, don’t forget how much reviews (especially good reviews) matter to indie books! Also, each and every sale matters, so I thank you heartily for spreading the word, purchasing your copy (or two or three) and supporting me and this book! I’ll be back later to invite you to climb aboard the Launch Train! And yes, that’s a real virtual thing. All Aboard the Launch Train!